I first met Breece Pancake in the spring of 1975, a little more than four years before he killed himself. He was big, raw-boned, slightly slope-shouldered. He looked like one who’d done some hard work outdoors. At that time he had a job teaching English at the Fork Union Military Academy. He put the student-cadets to bed at ten and then wrote from taps till past midnight. He got up with the boys at the six-o’clock reveille. Breece showed up in my office at the University of Virginia one day and asked me to look at some things he’d written. The first story was pretty good; it turned out to be the best of his old stuff. Possibly he was testing me with something old before showing the pieces he’d just done. He asked me to look at some more, and luckily I said yes. The next batch were wonderful. At the time the University of Virginia didn’t have much money for writing-students, so I tried to send Breece off to Iowa for a year to get him some more time to write. Iowa wanted him, but they were running low on funds. Breece got a job at the Staunton Military Academy for the next year and started coming to my story-writing class at the university. I thought he should start sending his stories out, but he held back for a while. Breece had gone to college at Marshall University in Huntington, West Virginia, but what was striking about his knowledge and his craft was how much he’d taken in on his own. He must have had an enormous concentration at an early age. He had a very powerful sense of things. 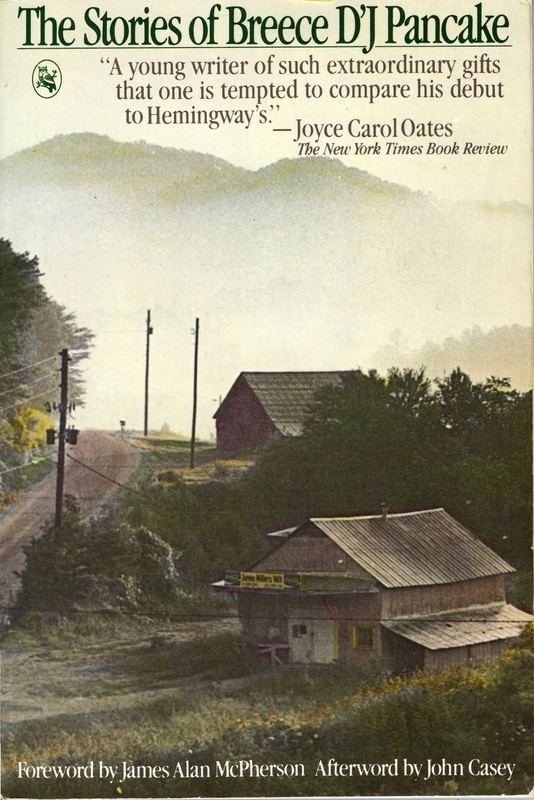 Almost all his stories are set in the part of West Virginia that he came from, and he knew that from top to bottom. He knew people’s jobs, from the tools they used to how they felt about them. He knew the geology, the prehistory, and the history of his territory, not as a pastime but as such a deep part of himself that he couldn’t help dreaming of it. One of the virtues of his writing is the powerful, careful gearing of the physical to the felt. He worked as hard at his writing as anyone I’ve known, or known about. I’ve seen the pages of notes, the sketches, the number of drafts, the fierce marginal notes to himself to expand this, to contract that. And of course the final versions, as hard and brilliantly worn as train rails. Not long before Breece and I got to be friends, his father and his best friend both died. Sometime after that Breece decided to become a Roman Catholic and began taking instruction. I’m as uncertain finally about his conversion as I am about his suicide. I’ve thought about both a lot, and I can imagine a lot, but there is nothing certain I would dare say. Except that it was (and still is) startling to have had that much fierce passion so near, sometimes so close. As with his other knowledge and art, he took in his faith with intensity, almost as if he had a different, deeper measure of time. He was soon an older Catholic than I was. I began to feel that not only did he learn things fast, absorb them fast, but he aged them fast. His sense of things fed not only on his own life but on others’ lives too. He had an authentic sense, even memory, of ways of being he couldn’t have known firsthand. It seemed he’d taken in an older generation’s experience along with (not in place of) his own. He was about to turn twenty-seven when he died; I was forty. But half the time he treated me (and I treated him) as if I were his kid brother. The other half of the time he treated me like a senior officer in some ancient army of his imagination. I knew a few things, had some rank, but he felt surely that I needed some looking after. There was more to it than that of course. More than these cartoon panels can show, he was a powerful, restless friend. After his year commuting from Staunton, we got some money for him. The creative-writing program at the university was coincidentally, and luckily, endowed, and Breece was among the first to get one of the new fellowships. He had time now to get to know some of the other writers on the faculty (Peter Taylor, James Alan McPherson, Richard Jones) and some of the new band of graduate students in writing. This was on the whole, good. The University of Virginia English department is a sophisticated place, both in a good, wide sense and a bad, narrow sense. The program in writing is just one of the many subdivisions—which is also, on the whole, good. On the good side, there were (and are) people on the regular faculty and among the regular Ph.D. candidates who understood and cared for Breece and his work. On the bad side of life in the department, there is a neurotic cancellation of direct, open expression, perhaps out of self-consciousness about how one’s opinion will be regarded, since opinion is the chief commodity. Sometimes it’s hard to get a straight answer. And sometimes it’s clear that some people hold that criticism is the highest bloom of the literary garden, and that actual stories or novels or poems are the compost. There was just enough of this attitude to give a young writer, however good, a sense of what social theorists call “status-degradation.” Breece didn’t know how good he was; he didn’t know how much he knew; he didn’t know that he was a swan instead of an ugly duckling. This difficulty subsided for Breece, but there was always some outsider bleakness to his daily life, a feeling that he was at the university on sufferance. Of course, Breece could be pretty thorny himself, and he spent some time getting mad uselessly—that is, over things that I thought were better ignored, or at the wrong people. One effect of Breece’s irritated energy was that he began campaigning for an M.F.A. degree for the apprentice writers, a so-called “terminal degree” to replace the uneasy M.A. The university now offers an M.F.A. in English, and it’s on the whole an improvement in that it’s a license for some of the subsistence-level jobs a writer might need along the way. Breece was a good union man. He was also a wonderful reader. He screened prose fiction submissions for Virginia Quarterly Review and, in the spring of 1979, for the Hoyns Fellowships. He and I and another friend of ours went through a bale (that’s a file-cabinet drawer, stuffed). In some ways we were engaged in the most functional form of criticism—picking twelve potential writers out of the bale. From his clearheadedness and good humor then, and from the way his work was going, I guessed Breece was in good shape. He’d sold another two stories. He gave a reading of yet another to a full house. He had some job prospects, and he was getting ready to leave Charlottesville. He began giving away his possessions to his friends. He’d always been a generous gift-giver—when he came for a meal he’d bring trout he caught, or something for my daughters (for example, bathtub boats he’d whittled, with rubber-band-powered paddle wheels). When he began to give away his things, it looked as if he was just preparing to travel light. No one close to him guessed. Even that sentence about getting a divorce from life is only clear in retrospect. And from other signs and letters it’s hard to say how intentional, how accidental his state of mind was when he killed himself. Breece had a dream about hunting that he logged in his notebooks, I think not long before he died. In the dream there were wooded mountains and grassy bottomland. Clear streams. Game was abundant. But best of all, when you shot a quail, a rabbit, or a deer, it fell dead and then popped back to life and darted off again. There are a number of things that strike me about this dream. One is that it’s about immortality and paradise. It is the happy hunting ground. And so it’s still another case of a lore that Breece acquired almost sympathetically and folded into his own psyche. But the most powerful element is this: a theme of Breece’s life and stories is the bending of violence into gentleness. He struggled hotly to be a gentle person. One of Breece’s favorite quotations was from the Bible—Revelation 3:15-16.
would thou wert cold or hot. hot, I will spew thee out of my mouth. This is a dangerous pair of verses. Untempered by other messages, by the gentler tones of voice of the Spirit, they can be a scourge. It may have been simply a bad accident that Breece didn’t allow himself the balms that were available to him after his self-scourgings. I have three kinds of reminders of Breece. The first is the surprising number of people who have come by to talk about their friendships with him, or who have sent me copies of their correspondence with him. They all know how bristly Breece could be, how hard on himself. (On one postcard to a friend, in the spot for the return address, which was 1 Blue Ridge Lane, Breece wrote: “One Blow Out Your Brain.” The friend hadn’t noticed it. But the message on the card was to encourage the friend—keep on, keep on writing, have a good time, damn it.) But these people speak more of what Breece gave them by his head. I also have what Breece wrote. And then there is a third way—perhaps memory, perhaps a ghost. I’m not sure what ghosts are. The reflective, skeptical answer I give myself is that the vivid sense of dead people that you sometimes have may be like the phantom-limb syndrome—you still feel the arm that’s been cut off, still touch with the missing fingers. In like manner, you feel the missing person. Two weeks after Breece’s death, ad after a lot of people who knew Breece peripherally had asked the inevitable unanswerable question, I was walking home, dog-tired. It was about two a.m. I was on the Lawn, going toward the Rotunda, the dome bright under the moon. I was walking automatically and only slowly realized I’d stopped. I smelled something. I tasted metal in my mouth. I didn’t recognize the small for an instant. It was a smell I’d known well years before. Gun bluing. But inside this sense of taste and smell was a compelling sympathy, beyond the sympathy of that’swhat it smelled like to have the muzzle in his mouth. There was a deep, terrifying thrill that I would never have dreamed of, a thrill and a temptation that sucked at the whole body. I wouldn’t have thought of that. I wouldn’t havedared to think of that. In that dizzy urgency of sense, even while I was opening to it, there was something reassuring about it. As much as the letter he left, it was alarming, but loving: Don’t go on thinking about why. Feel what I felt for an instant. You don’t have to believe anything but this—that’s just the way he said things. There were several more of these sentences over the next year. One a rebuke, the next two gently agreeable. Then recently, again late at night in a lukewarm bath, only a distant murmuring. What? I thought. What? Now there’s the less excited working of my mind alone: Breece would have liked this or that, this stream, this book, this person. This would have made him angry, this made him laugh. A lot of people miss him, and miss what he would have gone on to write. I think about the many things I learned from Breece. I think, with somewhat more certainty than a wish, that Breece’s troubles don’t trouble him or the people who struggled with him and loved him, that a good part of what he earned from struggling with his troubles remains.